Prime Minister Dasho Tshering Tobgay and the Agriculture and Forests Minister Yeshey Dorji handed over farm road construction machinery to the 20 districts yesterday at Central Machinery Unit in Bumthang. The Japanese government donated the machinery worth about Nu 445 million to Bhutan earlier this month. Each district received an excavator and a backhoe with other equipment worth about Nu 10 million. 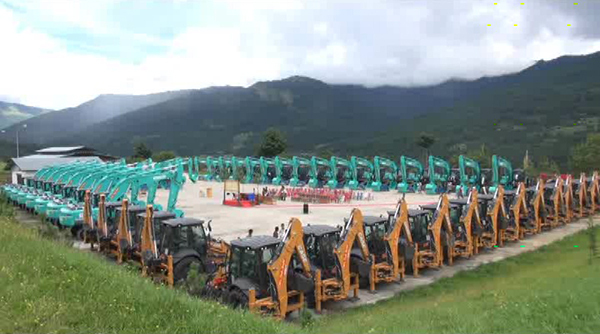 The fleet is the largest consignment of farm road construction machinery Bhutan ever received from the Japanese government. This is the third phase of assistance from the Japanese government for farm road construction in Bhutan. The Handing and Taking Over notes were signed between the agriculture minister and the Dzongdas of the 20 districts in presence of the Prime Minister. “We now have about 9,000 kilometers of farm roads throughout the country, so it’s difficult for the central government to look after all of them, ” said the Prime Minister. “We have to now give the responsibility to the Gewog and Dzongkhag administrations. The use of the machinery will be governed by certain guidelines. For the current financial year, the machinery will be used for construction of new farm roads in the districts. The machinery will also be deployed for farm road maintenance, land development, monsoon restoration works and during the time of emergencies.